All packages are sold by weight, 5 oz. 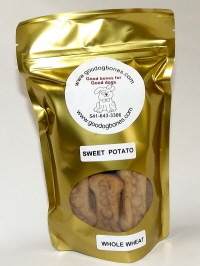 Qty of bones per pkg depends on the treat size you purchase. 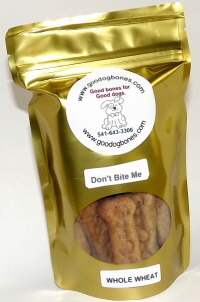 Don’t bite me flavor - whole wheat flour, rye flour, all purpose flour, oats, corn meal, brewers yeast, garlic powder, vegetable oil, egg, bouillon cube, water. 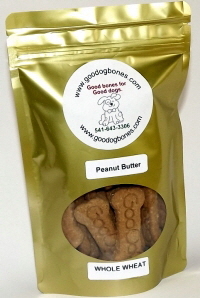 WW peanut butter - whole wheat flour, oatmeal, pure peanut butter with no salt, sugar or oil added, water. WW banana peanut butter - whole wheat flour, peanut butter, fresh bananas, oats, egg and pure maple syrup. 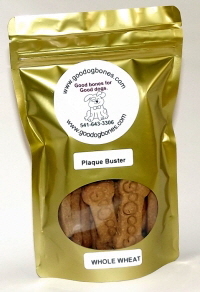 WW plaque buster - whole wheat flour, rolled oats, corn meal, powdered skim milk, bulghur wheat, water, bouillon cube, egg. WW sweet potato - sweet potato, peanut butter, whole wheat flour, oat flour, aluminum free baking powder, water. 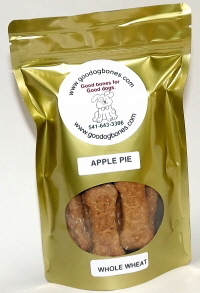 WW apple pie - whole wheat flour, oats, apple sauce, eggs, vanilla, honey, coconut oil, cinnamon. 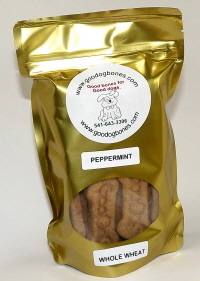 WW peppermint - whole wheat flour, parsley, flax seed meal, canola oil, bouillon cube, peppermint oil. 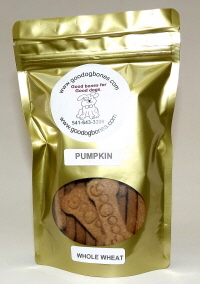 WW Pumpkin - pumpkin puree, whole wheat flour, eggs, flax seed meal, water. 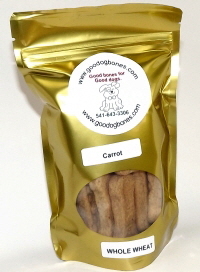 WW carrot - fresh carrots, whole wheat flour, peanut butter, eggs. 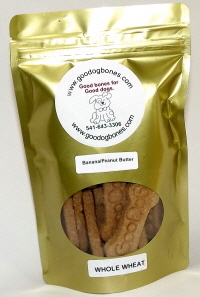 If you're looking for Name Bones you'll find them here in a new gluten free recipe! Copyright©2019 GooDog Bones, Myrtle Creek, OR 97457 All rights reserved.